The climate change discourse has engendered considerable international debates that have dominated the environmental agenda since the mid-1980s. Currently addressing the threat of climate change is a global priority. In the context of the significant attention to climate change at global level, debates regarding identification of gender perspectives and the involvement of women in addressing climate change have arisen. It is believed that men and women will be faced with different vulnerabilities to climate change impacts due to existing inequalities such as, their role and position in society, access to resources and power relations that may affect the ability to respond to the effects of climate change (WEDO, 2007; Commission on the Status of Women 2008; Carvajal et al. 2008; BRIDGE, 2008). Currently there is insufficient knowledge regarding gender differentiated impacts of climate change. As a result policy and decision-makers are not aware of the need for gender differentiated policies. It has therefore become important to understand the interrelations between climate change and gender so as to design effective climate change polices. With particular attention to South Africa, this study aims to examine the interrelations between climate change and gender so as to make a contribution to the existing information gap on the gender differentiated impacts of climate change. The study will also aim to create awareness amongst policy and decision-makers about the need for gender differentiated adaptation policies. The study was conducted in rural areas located in uMzinyathi and uMhlathuze district municipalities. UMzinyathi and UMhlathuze are among the municipalities situated in Kwazulu-Natal. Kwazulu-Natal is a province of South Africa that forms the east coast of the country. It is South Africa’s most populous province with a population of 9 426 017 million people. Apart from being South Africa’s most populous province, KwaZulu-Natal has the biggest poverty gap of R 18 billion with 61% of the population living in poverty (HSRC, 2004). The study makes use of qualitative research techniques guided by a combination of gender analysis tools. The techniques include participatory rural appraisal in the form of focus group discussions, role play, life histories and key informant interviews. Through these techniques, primary data was collected to understanding the differences in gender roles, activities, needs, and opportunities in the context of climate change. The results of this study cannot be used to generalise South Africa as each community is unique and will differ in culture and values. However, the findings are an important step in unveiling the dynamics and realities of gender differentiated impacts of climate change including climate variability. In addition, with a wide scope of analysis and mthe time constraints this report cannot claim to be exhaustive, nevertheless every effort has been made to ensure that key emerging issues are highlighted. In trying to understand gender and climate change in the context of South Africa, it is important to appreciate gender and gender relations in the country. In this context the contemporary position of women in South Africa cannot be fully appreciated without an understanding of the ways in which colonialism, capitalism and apartheid have morganised social relations and fractured society along racial, class and gender lines (Baden, et al., 1998). South Africa therefore presents a unique situation from a political perspective, particularly with reference to apartheid. Since the establishment of the democratic government in 1994, various significant developments have occurred to set the pace towards building gender equality in South Africa. Having recognised that gender is dynamic and that gender roles are neither natural nor sacred, a number of progressive policies and legislation have been put in place to set the context for gender transformation. This is to encourage a situation in which women and men can make real choices about their own lives and other issues. In spite of the major gains, there still remain enormous disparities and inequalities between men and women. The most important challenges are faced by women in rural areas who are still living in poverty with limited resources to ensure sustainable livelihoods. Given that the men and women in both study areas are poverty stricken with dependency on agriculture and natural resource for their livelihoods, climate change poses a risk for them. Gender differentiated impacts of climate variability were manifested in the unequal distribution of roles and responsibilities of men and women in both study areas. 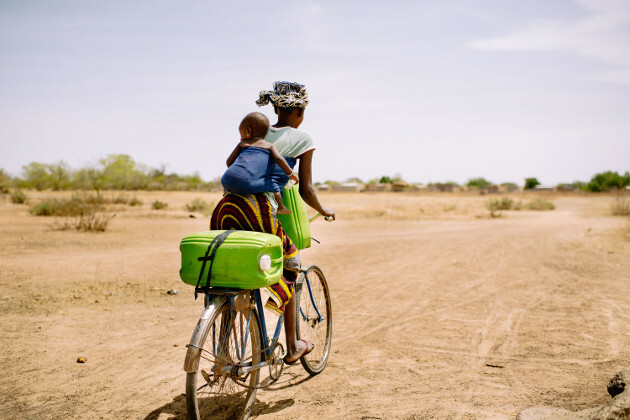 Results reveal that through socially constructed roles and responsibilities, women seem to bear the most burdens resulting from climate variability impacts. Women’s burdens were more evident in their response to the impacts of climate variability. Women were found to have extra workloads when faced with climatic stressors as they made efforts to cope with them. Working longer hours than men affected them not only physically but emotionally drained them as they constantly have to worry about the well being of their household members, especially children and the youth who depend on them. Although the men’s work load is lighter than that of women they are also impacted by climate variability. Men’s impacts are more psychological than physical. Their psychological effects are further compounded by unemployment resulting in negative coping mechanisms. There is therefore no doubt that climate change will impact differently on rural men and women. The results also show that gender roles are undergoing change due to climate related impacts which are further heightened by factors such as unemployment, HIV/AIDS and poverty which forces men and women to engage in different activities leading to new roles. With more women diversifying their livelihoods, gender roles are also being impacted. There is a change in gender roles to accommodate responses to the impacts of climate variability. In this study it was evident that women are now are involved in activities that generate earnings, thus reshaping relationships between men and women. The income generated by women through trade is used to sustain the household. Women generating an income also have more opportunities and power to decide what the income can be used for. The shift is also driven by the country’s constitution, gender legislations in the KwaZulu Natal province, the need for women to provide for their families and women’s determination to see change that will improve their position in society. Women have also come to realise that it will take more than the constitution and decent laws to end gender inequalities. They strongly believe that in addition to the constitution and the laws, men need to accept the changing role of women in post-apartheid society. Women are aware that the constitution and the laws simply provide an enabling environment and a platform, from which women can voice their concerns. The rest depends on their determination to make the laws and the constitution work to for them. The study shows that women are very knowledgeable and innovative with regards to coping with the impacts of the changing climate. Lessons can be drawn from their knowledge on how women can be better assisted to adapt to climate change. Results confirm that women play an important role in supporting households and communities to cope and adapt to climate variability. The study strongly recommends that to effectively address issues of gender and climate change, focus must not only be on negative gender experiences but also assess and acknowledge progress that has been made in addressing gender issues and social changes that have taken place and lead to changes in gender relations. Lessons from positive experiences can be used to guide the way forward in achieve gender equality. Mainstreaming gender into climate change is very critical and requires a holistic approach. While addressing issues relating to gender inequality it is also vital to look beyond gender inequality and assess the different needs and choices that men and women make that eventually impact on their way of life and the way they respond to climate related impacts.